Welcome to the sixteenth issue of the Columbia College Class of 1963 eNewsletter. Sorry that the issue is late this month, but I have actually had some paying deadlines to fulfill. Anyway, It means that I can report about two class lunches since the last issue. May's and June's luncheons were attended by many of the usual gang, but each included someone who was making their first trip to 43rd Street. See the notes below for details. Next month's lunch will be on Thursday, July 13, and will be the last until September 14. Sid Kadish, my esteemed predecessor as class correspondent joined me for the Third Annual Parade of Classes on Tuesday, May 16 (Class Day) at Columbia. Sid braved the sodden day, and marched proudly with me holding our Class of 1963 flag. Sid was also at Columbia to attend with his wife Helen, the graduation of their daughter, Emily Kadish, '06. I'll let him tell us more of his day in the class notes below. Also graduating from the College was Zachary A. Zill, '06, son of Nicholas Zill and his wife, Karen. Congratulations to all. I am sad to report that Louis Iacueo died on November 10, 2005 in Covina, CA. I have no other details. If any of you would like to share reminiscences in our class notes, or submit an obituary to CCT, please let me know before July 4. If this is your first visit here, I've added a link to an archives page, which in turn, will link you to the past issues of the Class of 1963 eNewsletter. Keep those notes coming, and share your memories and your recent news. If you know how to contact any of these classmates, please let me know. And send me the names of any other missing friends, and we will try to find them. Please join your classmates for an informal lunch at the Columbia Club every second Thursday of the month. It is our hope that these gatherings will renew old friendships and foster improved relationship with our class and the College. This month, Thursday, July 13, 2006. 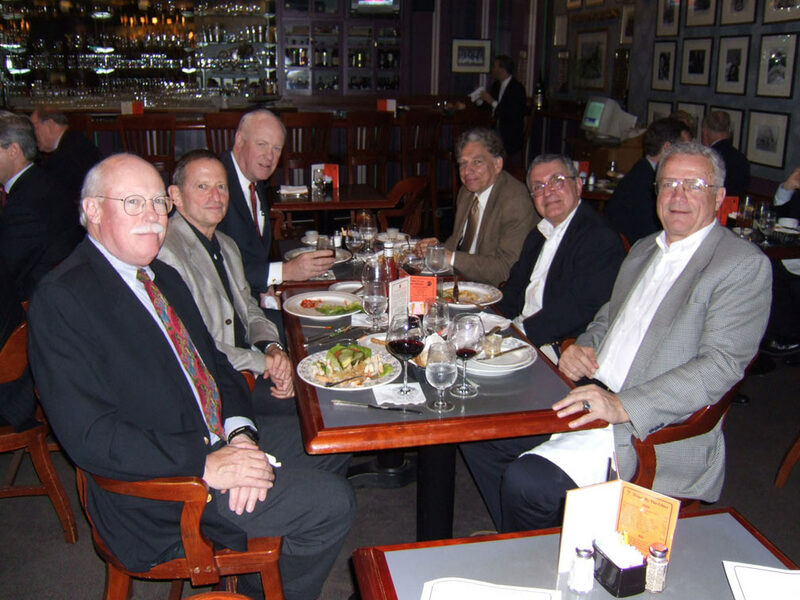 The Sixteenth Second Thursday Class of 1963 lunch was held on May 11. 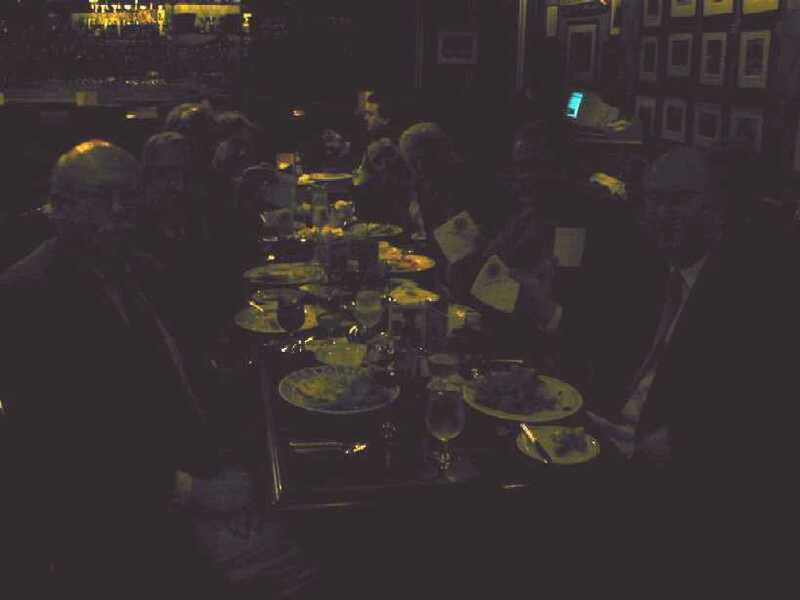 Several of the regular Second Thursday Club members, including Steve Barcan, Steve Bauer, Larry Neuman, Bob Heller, Tom O'Connor, Jerry Dwyer and Paul Neshamkin, were joined by Brooks Zern who finally decided to find out what kept us coming back to the Columbia Club. Brook had much to share with us including his expertise on Flamenco (who would have guessed that a class of 63er would be a top expert). A fabulous group as always. Unfortunately, my camera chose this day to give up the ghost, so here are several poor attempts to cover the entire crowd. Click here for a passable candid shot. The Seventeenth Second Thursday Class of 1963 lunch was held on June 8. Many of the regular Second Thursday Club members returned, Larry Neuman, Tom O'Connor, Barry Reiss, Paul Neshamkin, and Jeff Thompson were joined by first-timer Bob Morantz who traveled from Saint Louis to join in our lunchtime antics. . A fabulous group as always. Pictures have been improved over last month only slightly. A new camera having been purchased, but not mastered. 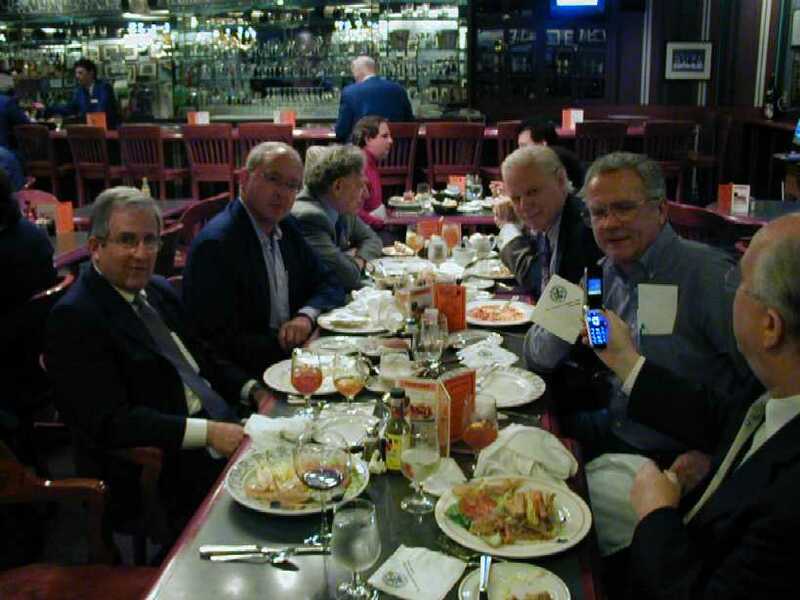 (From left to right): Paul Neshamkin, Bob Morantz, Jeff Thompson, Larry Neuman, Barry Reiss, and Tom O'Connor. Click here for more shots of the lunch. I hope you can all join us (please encourage your friends to come with you) at the next lunch on Thursday, July 13. Let me know if you will attend so that we can reserve a big enough table; RSVP to Paul Neshamkin (pauln@helpauthors.com). Here are the unedited (and unexpurgated) notes and news that you have sent in the last month. Not much, it would be great if I heard from some of you before the next issue (and deadline for the Columbia College Today September issue (July 4). Sidney Kadish writes, "Rains pelted eastern Massachusetts and caused serious flooding during the first two weeks of May, 2006. Hoping to escape the Noah-like deluge in New England, we set off for daughter Emily’s graduation from Columbia College. But Class Day (May 16, 2006) proved to be a heavily rained-on exercise. Despite the sodden atmosphere, joy prevailed. Emily (CC ’06) joined her brother Michael (CC ’96) and her father (CC ’63) as a graduate of our beloved Alma Mater. We heard John McCain, an indifferent speaker, address the graduating class. We even had the privilege of marching, nay slogging, with Paul Neshamkin, bearing the “Class of 1963” banner to the music of “Pomp and Circumstance.” The next day, University Commencement, was bright, cheerful and sunny. As written on the big buttons that the alumni staff distributed, we were indeed a “proud Columbia family.” Sid added that Wednesday, Commencement Day, was beautiful and sunny "and that's when we took our pictures." Michael Terman, '64 writes, "We can extend Scott Blue's history a bit beyond Stephen Langfelder's May/June 2006 report of Scott's demise. He was the son of Ira Blue, the famed KGO-San Francisco radio talk show host. He was one of many Columbia psychology majors of the era who found their way to Brown for Ph.D. studies. He worked in a voluble lab of Columbia émigrés led by Rosemary Pierrel, who had left Barnard for the Pembroke deanship. With them he published three important papers on auditory intensity discrimination in the Journal of the Experimental Analysis of Behavior. He became assistant professor at Rutgers, but soon after disappeared back to California, cutting off old ties to his friends' consternation. Wish we knew more." John Karlberg, wrote to say that he enjoyed the article about Michael Hassan in the May issue of CCT, they were roommates for all four years, but had lost touch. He asked for his email address (I'd be happy to put each of you in touch with classmates if you let me know it's OK). John sent the following when I asked him for his news, "After 42 years in transportation and being president of three different companies since 1979, I am winding down. My wife of 41 years, Anne, and I have three married daughters and seven grandchildren ranging from two months to 21. We have homes in Palm Coast, FL and Pocono Pines, PA where we expect to split our time, starting this winter. We love to play golf and tennis and I'll continue to serve two directorships. Life is just right!" When you send your notes in, please indicate if you would like to share your email address(or web site) with your classmates, I've been inundated with requests to pass this information on. Always great to hear from you all.